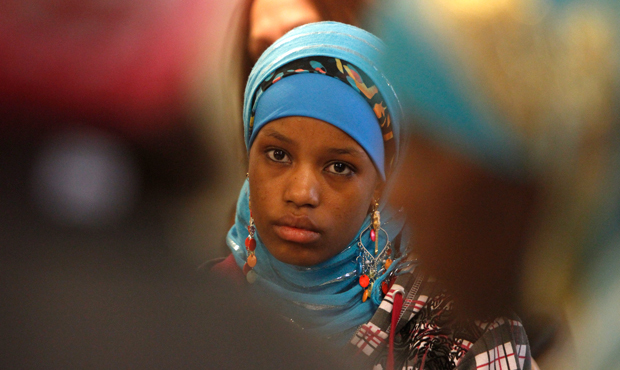 Barwako Abayle, an immigrant student from Burlington High School, listens during a meeting with lawmakers about racial inequality at her school on April 26, 2012 in Montpelier, Vermont. Note: This is the second of two columns on black Americans and immigration reform. Today, I examine the history and plight of black immigrants in the United States. Thanks in large part to the prevalence of media narratives, the current discussion of immigration reform is often represented by a Latino face. This works well to impress a human story in portraying the need for the nation to reform our dysfunctional immigration system. But the emphasis on the Latino story as the immigrant story fails to capture the broader, more complex issue. Many Americans are familiar with the stories about work-seeking immigrants who crossed our southern border and are compelled to live and toil in the shadows of opportunity. Often overlooked or ignored, however, are the estimated 3 million black immigrants whose daily plight in the United States is no less dramatic or demanding of public attention. While the vast majority of black immigrants are legal residents concentrated in large cities such as New York, Chicago, Los Angeles, and Miami, an estimated 400,000 of them lack documents that would allow them to live openly. As is the case with any immigrant to the United States, black immigrants find their way to this country in search of their own American Dream. Yet unlike many white immigrants, they discover heightened barriers in reaching their dream. The persistence of racism and anti-black bias in many forms of American life comes as a rude awakening to those who expect opportunity to be limited only by their willingness for hard work. Although the nation has long had a significant black population, owing to its legacy of slavery and the importation of Africans as chattel property, the history of willful and voluntary black immigration is a relatively recent development. According to figures in a recent Pew Social Trends report, immigration from the Caribbean—primarily Jamaica, Haiti, Trinidad and Tobago, and the Dominican Republic—ticked up after the Spanish-American War ended in 1898. But the real expansion occurred after passage of 1965 federal laws that enabled people from countries other than Europe to find their place in this country. Immigration from Africa was rare until the late 20th century, as many came from Africa to study in the United States and decided to stay. The Pew report estimates, however, that about 21 percent of African immigrants are undocumented. Moreover, no single country dominates the flow from the many African nations. Nigeria, which produced the largest single group of black immigrants in 2009, only accounted for about one in five of all black African immigrants that year, Pew reported. Immigrants from Africa were also among the fastest-growing groups within the U.S. foreign-born population from 2000 to 2009. If current trends continue, the Pew analysts predict that Africa will replace the Caribbean by 2020 as the major source of black immigration to the United States. Even with high levels of education, black immigrants tend to earn low wages compared to other similarly trained immigrant or native workers. In 2011 black immigrants had the highest unemployment rate—12.5 percent—of any foreign-born group in the United States. Proposed immigration reforms such asreductions in family-based admissions and elimination of the diversity visa lottery could affect the flow of black immigrants to the United States, cutting off all legal means of entry into the country. That’s unfortunate because immigration reform is needed to assist more than a single ethnic or population group. It’s required for fairness to all who currently work—and wait—in the shadows of opportunity. Short point here if it hasn't become obvious yet, the immigration issue of the U.S. is of no consequence and not concerned with African descended people. The only way anyone is going to DREAM in America is if one has lots of money. Other than that America is a NIGHTMARE. Who made the Europeans legal?? They're the largest gang of immigrants over here. Surely, it wasn't the Native Americans. Everyone here is foreign-born, when one wants to look at the TRUTH. What is legal? The point of the article is the fact that the Immigration debate is focused solely on Latino/Hispanic immigrants, while there are untold numbers of African immigrants "undocumented" in the United States; i.e., will/does "immigration reforms" that embrace Latino/Hispanics like the "Dream Act" also include the 'undocumented' African, Caribbean, [Black] immigrants as well? [Particularly since we have a "Black" President] [A 'Progressive' President]? This point was raised years ago in the forums. Basically the immigration debate is being used to benefit latin americans and no other group who immigrates to the U.S. I recall my point was raised about Haitians who never get to file for amnesty because if they do make it to U.S. shores, they're put in these prisons for illegal immigrants. This was happening in Florida. Because of this, I do not support this immigration reform non-sense. Also this is a point that Dr. Claude Anderson has raised time and time again in his lectures and its proving to be 100% correct. The answer is, yes .... whatever so-called "reform" eventually gets enacted in this country will include ALL immigrants - even African/Caribbean ones. But the thing is that .... they're "story" is much different from the typical "Hispanic immigration" story/problem. And since the numbers are OVERWHELMINGLY tilted towards the Mexican/Hispanic side ... that is the reason why they get all/most of the focus .... and why the conversation centers more around 'what to do about them'. The majority of the Hispanic/Mexican ILLEGAL immigrants sneak over here from across the border and have no - and have never had any - right to be here. Whereas the majority of African/Caribbean who are here ILLEGALLY actually came here LEGALLY ... and have just overstayed their time. The African/Caribbean immigrants cannot "cross" (or walk) on water in the same vast numbers to get here like the Hispanic can. So many of them (Africans) either came here on (student or work) visas ... were let in as refugees ... or got here through family ties. But ... because such offers to be here are always temporary, after the time is up and they don't go back, they take on the same "illegal" status as those 11+ million illegal Hispanics and Asians who are here today. But an "illegal" immigrant is an "illegal" immigrant. And the new laws/reforms that are being worked on right now on will take into consideration and cover the "what to do with" ANY immigrant who is currently living here under an illegal status who gets caught doing so. After reading the first part of this two-part column ... it sounds to me like this author is NOT simply altruistic about the subject and has an agenda toward trying to push Black people to unify with "immigrants" and join and accept the immigration reform debate as something 'positive' for us. I, personally, don't agree with that perspective. However, I DO understand the rationality and reasoning behind it. Black Americans have just been pushed ... make that shoved .... down the political and social totem pole a considerable amount ... and, once this "path to citizenship" thing comes down .... our standing here is going to do down even FURTHER than it already has. Although all is not TOTALLY dead and buried for us yet .... we will soon not have the numbers nor the clout we used to enjoy as the "majority-minority Americans" in this country ... and once the majority of the current Hispanic population is allowed to VOTE (by the wholesale granting of amnesty/citizenship) ... we can kiss our (social and political) ASSETS goodbye!! And the ONLY thing I can see doing, right now, at least, to try to stave that off and keep us viable as far as having/keeping any type of reasonable power .... is that we EDUCATE our people NOW .... to start getting OUT of the "low-wage earner" class (that a lot of those 'instant citizens' will become a part of) that so many of our people are stuck in and have no choice but to have to fight for when it comes to obtaining jobs. Nobody's gonna raise Black people up EXCEPT Black people. And the MORE boots that we allow to come in here stand on our necks to keep us down ... the harder - or more impossible - it's going to be to make that happen. If this is true, then, I don't know if I can continue to support Immigration Reform, especially, if it is being promoted by our president who happens to be Black. "The answer is, yes .... whatever so-called "reform" eventually gets enacted in this country will include ALL immigrants - even African/Caribbean ones. But the thing is that .... they're "story" is much different from the typical "Hispanic immigration" story/problem. And since the numbers are OVERWHELMINGLY tilted towards the Mexican/Hispanic side ... that is the reason why they get all/most of the focus .... and why the conversation centers more around 'what to do about them'." Oh, well disregard my previous post.